← Page 291/365 : A two-game weekend? 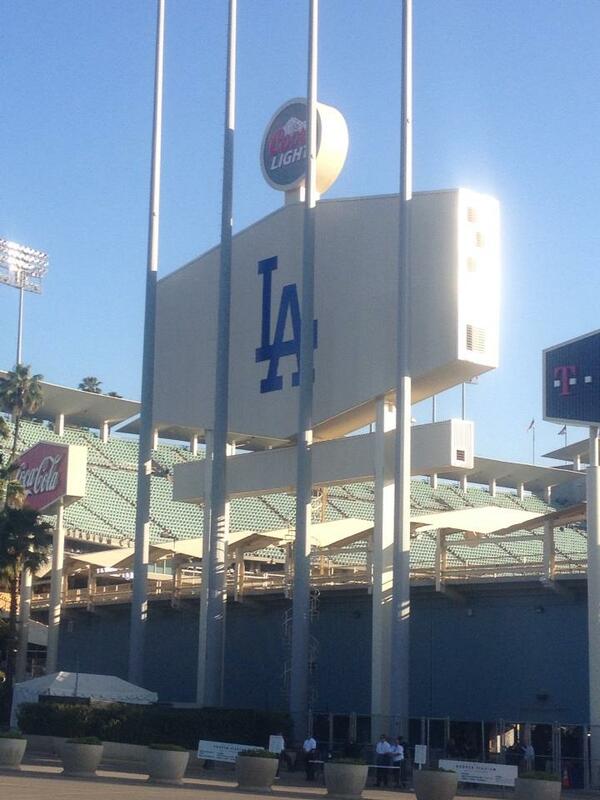 It’s all over…well for the Dodgers anyway. Last night (well, early morning 1:30am start) the LA Dodgers closed out their season with an unpredicted 9-0 loss to the Cardinals in Game 6 off the NLCS, losing the series 4-2 and ending my first season as a baseball fan, and as a Dodger fan…and what a season it’s been. I live in the UK and baseball just doesn’t get that much coverage over here. Speak to anyone here in England and you’ll be treated to the “It’s just glorified rounders!” comment, along with the obligatory moaning of how long a game takes. And I have to say, a while back, that was my mentality about the sport too. Years ago, I had seen a few games of the World Series whilst in Vegas on the TV, but hadn’t really paid that much attention to it to make me follow it any more than that. 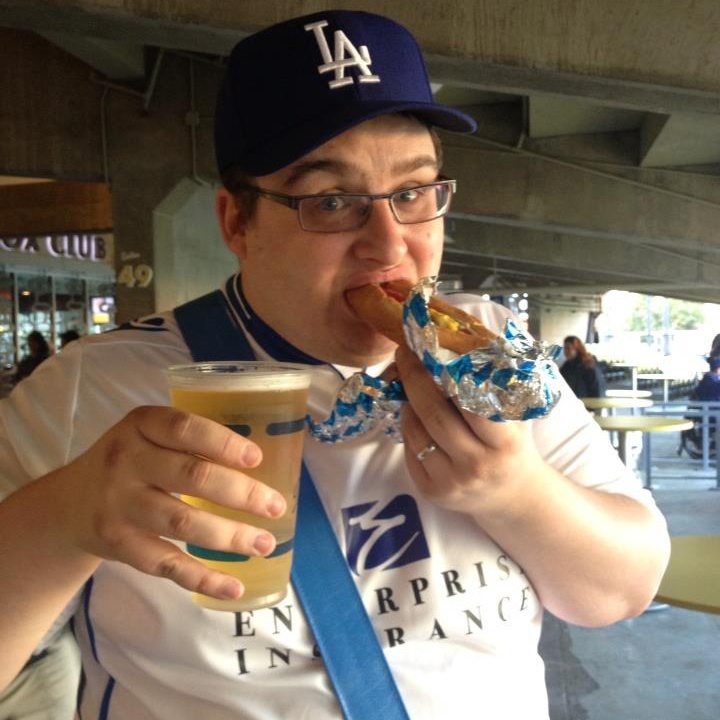 …Valentine’s Day 2013…my then-Fiancee Elle bought us two tickets to go see the Dodgers play at Dodger Stadium in April as part of our Honeymoon. 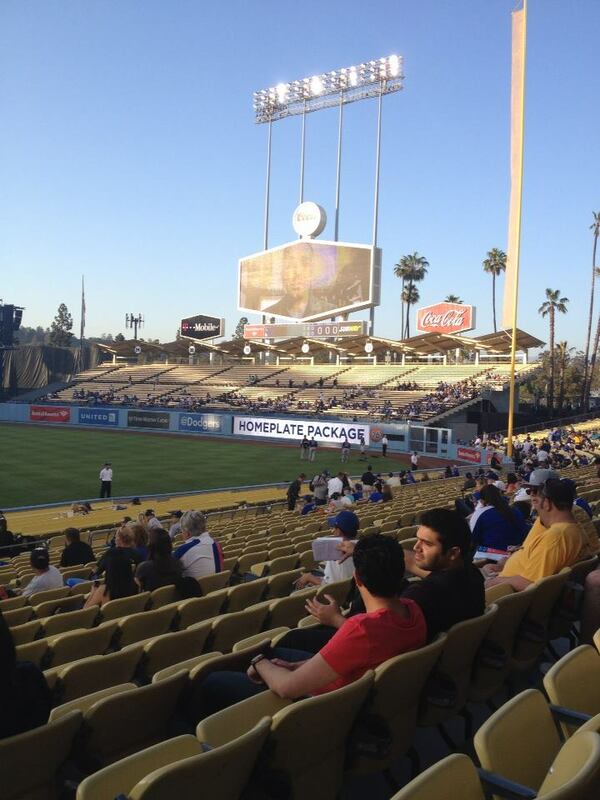 We were getting married on April 20th and flying out to Vegas & LA a few days later…and now I was set to go to a Baseball game for the first time in my life. Naturally, I wanted to know more about the sport. We subscribed to ESPN and started to watch. Back in February and March, the only games taking place were the games from the World Baseball Classic. And naturally, the only games I was that bothered about were the ones the USA were taking part in. So I caught some of those games. It gave me the vital background and knowledge I would need for what was to come. April 1st. 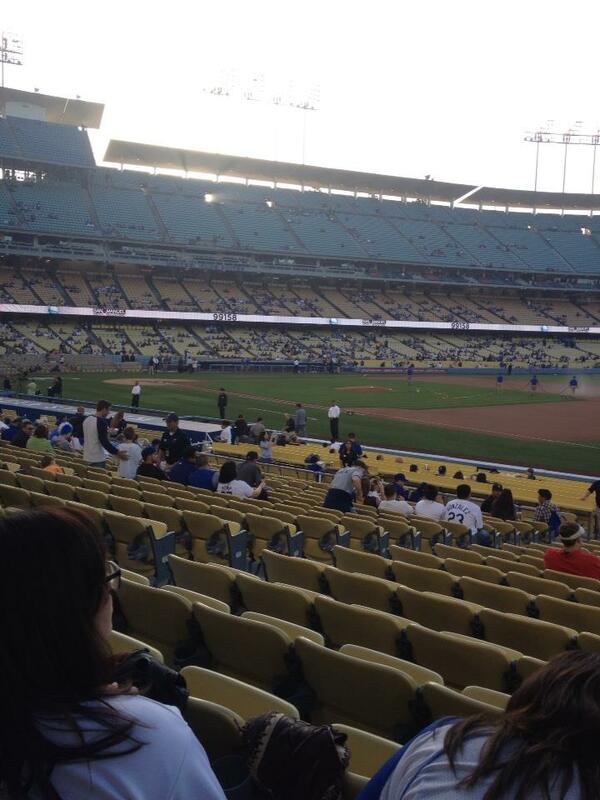 Opening Day for the Dodgers. Clayton Kershaw was on the mound. His pitching was clearly of a different class. It was a fantastic pitching performance, but offensively, nothing was happening. The game went all the way through to the 8th innings before Kershaw stepping up to the plate, and in a moment that actually saw me jump out of the chair and yell “YES!”, Kershaw powered a hit straight up the centre and out of the park for a one-run Home Run. Having not been content with pitching like a demon, he kickstarted a fantastic 8th innings which saw the Dodgers take a 4-0 lead and win the game convincingly…a new fan was born…I was officially a Dodger! Over the next few weeks, I managed to watch as many matches as possible…which were proving hard due to the time difference and plenty of games not starting until 3am UK time. But I stuck with it. 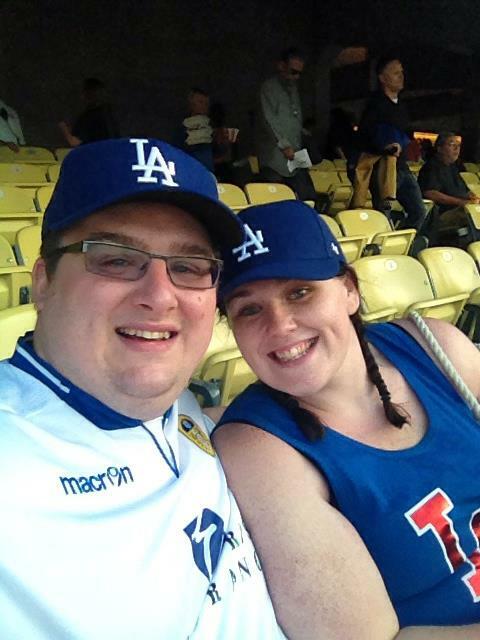 Following the wedding and the first part of our honeymoon in Vegas, we were ready to go to Dodger Stadium. 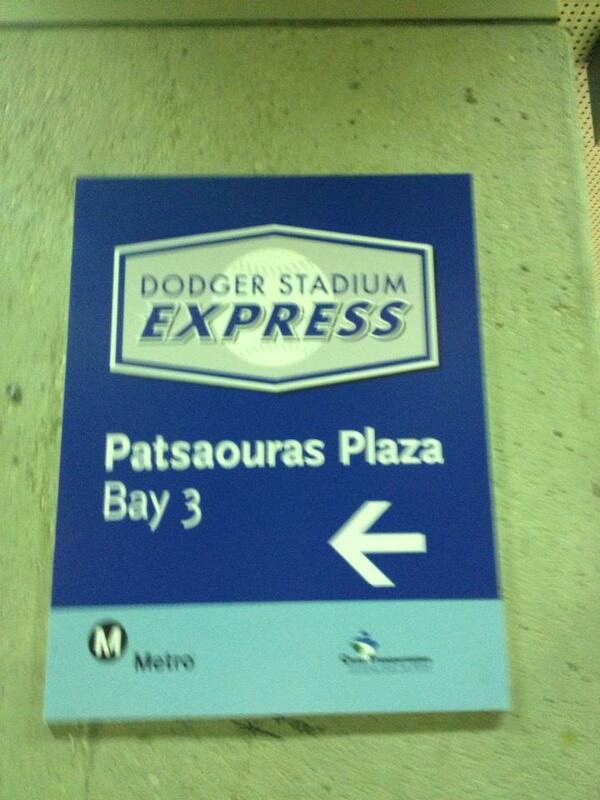 It was April 29th and we were staying in North Hollywood so we jumped on the Metro to Union Station then hopped onto the Dodger Stadium Express over to the stadium. 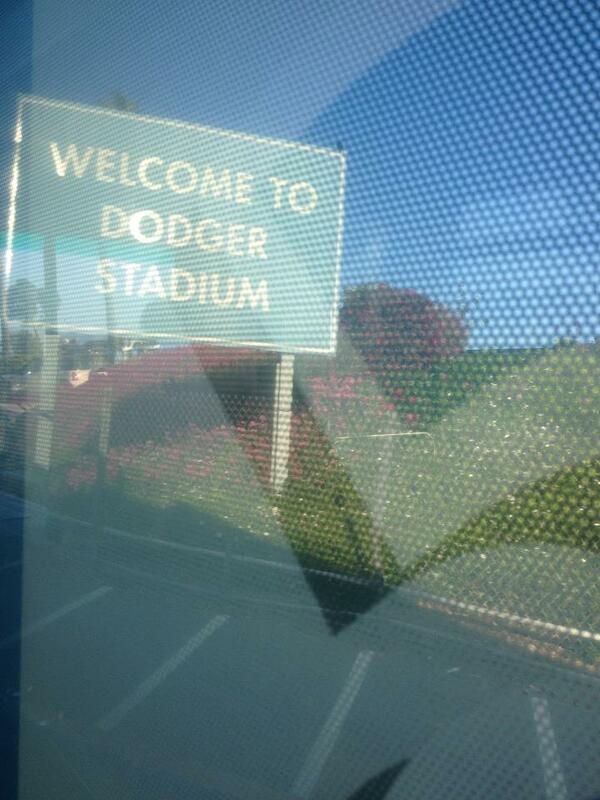 Unfortunately…the Dodger’s weren’t ready. The day got off to an interesting start when the woman next to us did a rather interesting version of the National Anthem…which I had to record…. And we were under way. Colorado Rockies were in town…I had my glove (which I soon realised was a kids’ glove)…and the Rockies brought their big hitting game. Dodgers pitcher Ted Lilly struggled from the outset, giving up 4 runs in the opening innings…leaving the crowd a little flat. By the end of the 5th innings, the Rockies were 10-0 up…the game finished 12-2 to Colorado…it would be enough to put anyone off watching the Dodgers for life…but the whole experience was massively enjoyable. I found myself flicking through hotel room TV channels trying to find a Dodgers game and checking online for scores all the time. The Dodgers promoted a rookie by the name of Yasiel Puig into the starting lineup after he had been impressing in the minors. He notched a couple of hits in his first four at-bats in his opening game, and really impressed with a stunning arm for throwing…could this kid change things around? His next game he hit two home runs….the answer was yes! June 22nd is the date that the Dodgers look back to. They were propping up the rest of the teams at the bottom of the table with seemingly no way back…but backed by the ever-developing and always entertaining Puig, the Dodgers fortunes began to turn. Within exactly one month, the Dodgers went from bottom place to flying high. A run of 50 games saw an amazing 42 wins. It was truly an amazing comeback and as soon as the Dodgers climbed back to the top of the table, it was a position they would not give up for the rest of the season. But as the post season arrived, and with the likes of Matt Kemp being written off for the whole of October, the Dodgers began to see a dip in form. It felt like a slog getting them over the line and confirmed as champions of the West, but they got there eventually. Up first were the Braves. Dodgers fared pretty well and swept them aside with a 3-1 series win. But the Cardinals would prove much tougher and took a commanding two game lead after beating both Greinke & Kershaw at Busch Stadium. Dodgers then won 2 out of 3 of the games at Dodger Stadium…but then on a return to Busch Stadium last night, Kershaw had the fate of the Dodgers in his hands and unfortunately things just didn’t go as they should have. After an abysmal 3rd & 5th innings saw nine runs scored by the Cardinals there was no coming back. It was extremely sad for everything to come to an end so abruptly, but the past 7 months have put into my mind that next year, I will be a Dodger fan and I can’t wait to go through it all over again. The very best of luck to the Cardinals…but I think the Red Sox will smash them in the World Series…which will definitely please my mate Steve, with whom I have a healthy fan rivalry with. 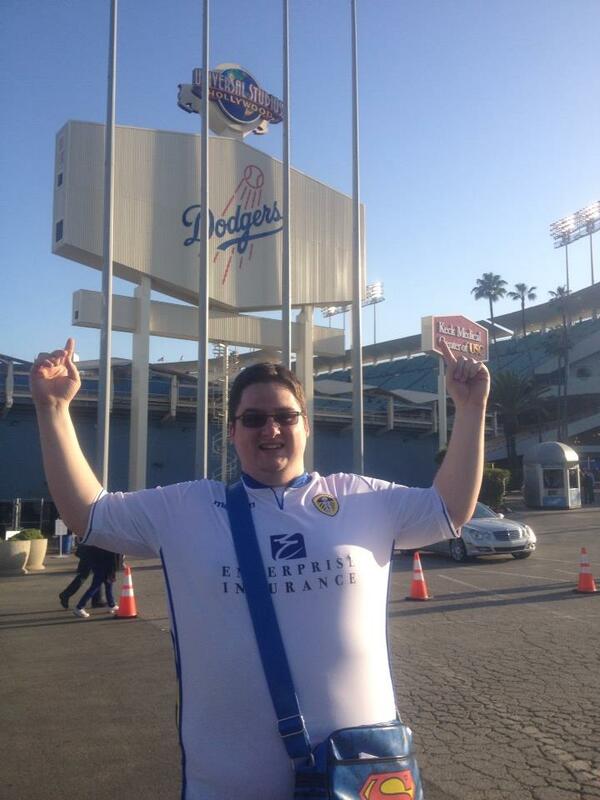 I am proud to call myself a Dodger fan. I am proud to wear the Jersey and the Cap. This entry was posted in 2013, 365, Baseball and tagged Cardinals, Dodger Express, Dodger Stadium, Dodgers, LA, LA Dodgers, Los Angeles, NLCS, NLDS, Opening Day. Bookmark the permalink.